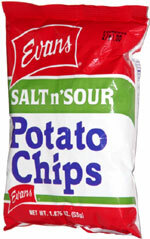 Taste test: These are good chips with a tasty but mild vinegar flavor and a good helping of salt. They put a good number of chips into this 50 cent bag. Smell test: Mild vinegar aroma. This snack was discovered by Jeremy at Osco Drug on State Street in Chicago. Review published .